Take the stairs at 90 Manners Street up to Homies Cosy Teahouse and you’re never quite sure who, or what you’ll encounter. As the name suggests, it’s a warm, generous but undeniably cool space, run by young people for city dwellers to meet, share, be entertained or take time out in. Helping make it accessible to all is a pay it forward scheme – donate what you can. On a Wednesday lunchtime when Urban Dream Brokerage visited, coffee was brewing, a DJ was playing his decks midfloor, there was a new Homies zine to read, out the back the library and Playstation lounge were both busy, and we bumped into a friend getting work done. The upcoming busy events calendar included a Produce Club on the Sunday (“a chance to get social with vegetables”). Thanks to property owners Standard 806 Ltd, Homies is the 26th innovative use of vacant commercial space in Wellington city placed by the Urban Dream Brokerage. As we write, the 27th project - the second site for moving gallery Elbowroom - is getting ready to open, and project 28 involves, over the coming months, an 11-metre Totara log being carved into a Poutokomawana (carved post) at Chaffers Dock on the waterfront for the renovated Boys and Girls Institute. It will be a space for training and exhibiting the work of Maori youth. Established by organisation Letting Space with funding from Wellington City Council and Wellington Community Trust in 2013, Urban Dream Brokerage looks to create more diversity, community and activated spaces in the city, reduce vacancy, increase professionalism and help innovate business development. The dynamism and popularity of Homies is a great illustration of this, placing trust and responsibility for space in the hands of the young, new and less visible – whether they call themselves businesspeople, community leaders, entrepeneurs or artists – to assist the city’s and community’s development. Looking back it was a busy Spring at the Brokerage. 11 projects opened in September and October alone. We kicked off with the popular Imaginarium, which saw 5000 people over three weeks engage with this creative playground for young and old alike in the former Whitcoulls in Courtenay Place (thanks to Readings Courtenay Central). We all wanted it to go longer, and are keen to broker space for projects that seek to operate and grow over the longer term than a pop-up duration. Hairdresser Jason Muir seeks political conversation at Political Cuts. We’ve also been placing multiple projects into single vacant spaces, to see both better visibility and more effective use of space. Thanks to Positively Wellington Tourism we had access to the high profile empty site next to the Wellington Visitor Centre off Civic Square on Wakefield. 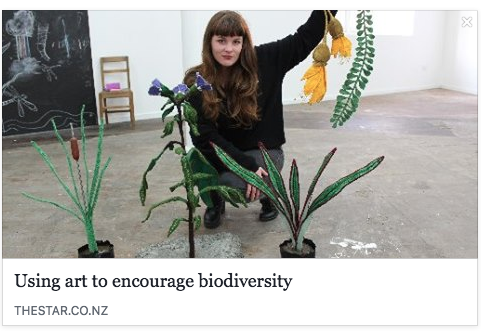 There we presented three projects, including a political hairdressing salon ahead of the general election (Political Cuts) and two very different artists were given the opportunity to present their first solo shows in Wellington. A property in Grey Street, courtesy of DNZ Property and across from the Intercontinental Hotel was activated through two public art projects (works by Julieanna Preston and Terri Te Tau) and, on Labour Day the site was visited by hundreds of people to attend yoga classes as part of Free Yoga Day. A key new objective in 2014 for the brokerage is seeing the kind of projects brokered broaden beyond public art to community projects, entrepreneurial start-ups and retail. Our criteria remains: they need to be innovative and accessible to the public, presenting something not yet seen in Wellington city. We have also been working for stronger representation of mana whenua in our city. We’re pleased on progress on all these fronts, but there remains a lot more work to do. Since January 2013 the UDB has had 135 applications run through its advisory panel, with 10 currently still to be processed. This doesn’t include the scores of enquiries before this stage. There are those that the panel don’t feel sufficiently meet our stated criteria, and many more again who find homes of their own accord, or for whom an idea simply fails to gain momentum for them at that time. We’re proud of the role the brokerage plays in providing a framework for this wider group of creative thinking people to consider how they might extend their work. This year we’ve been invited to speak of our work in Auckland, Wellington, Christchurch, Copenhagen and Newcastle, New South Wales. Spreading the word about Wellington as a people-centred and generous city. Wellington, The UDB and Homies Cosy Teahouse have been the subject recently, alongside Helsinki and New York, of a podcast by Monocle. We’ve also been able to speak about our work on Radio New Zealand with Wallace Chapman and at TEDxWellington. Fascinating proposals continue to roll in. They make us excited about the future of our city, forged on innovative ideas and a place where a diversity of publics feel at home. Check out the full array of projects by clicking through to the photo galleries on our homepage. Terri Te Tau at AuraSecura at 1 Grey Street.